Send and receive text messages directly from within Zendesk–no voice plan needed. 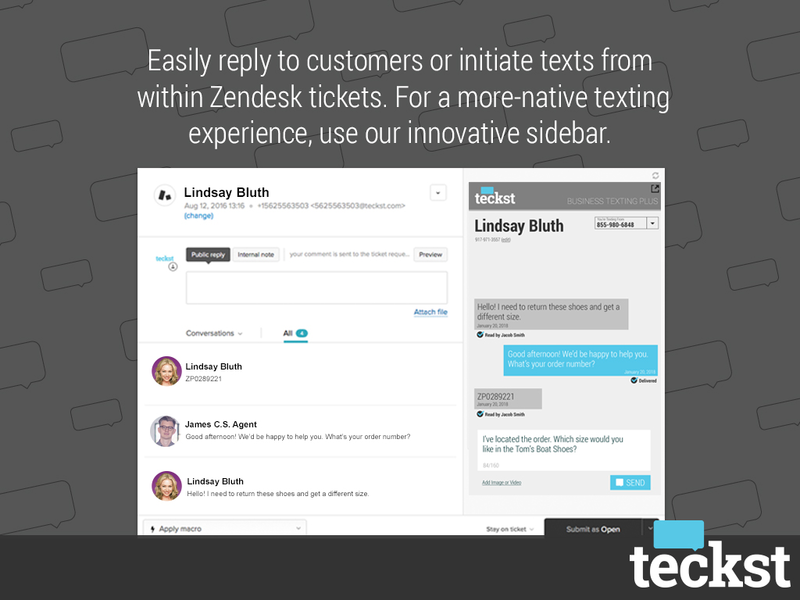 Text with Zendesk tickets, or increase efficiency by using our powerful sidebar to concurrently text/chat with up to 12 customers per agent. Take full advantage of exchanging images and videos–all from your current toll-free numbers. Join the nation’s largest ride-sharing, on-demand, e-commerce, and fintech, companies by using Teckst. Our experienced implementation engineers will set up Teckst for you–no heavy lifting on your end. Regardless of how complex your system may be, we match your rules, workflows and views with zero interruption to your service. 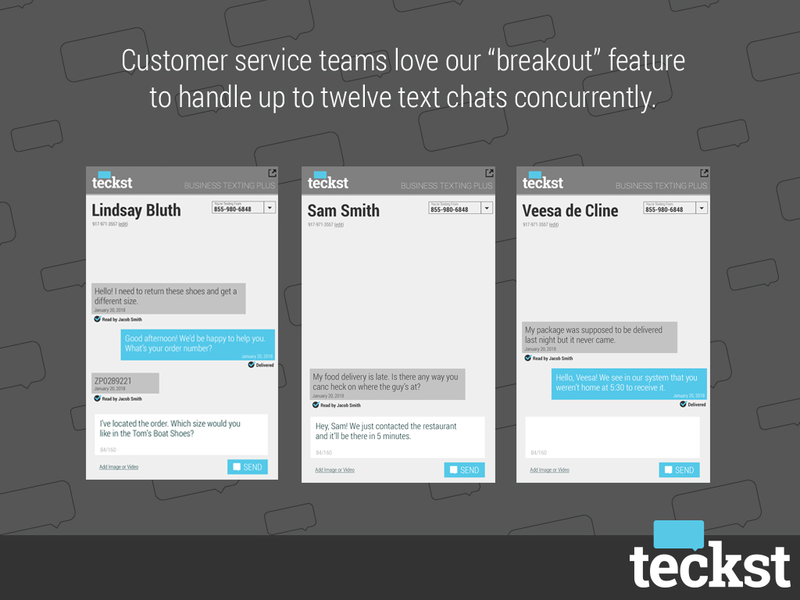 Teckst is set up for your entire team at no cost, no per-agent fees, and no per-text costs. We’ll also reply-enable your shipping notifications and order confirmations! Texts are delivered directly into your existing Zendesk queue so training is easy. We’ll text-enable your current toll-free numbers with zero interruptions to your phone service. We also image/video-enable your toll-free number so you can receive and send images from –the same number your customers call today. Automations for exchanges, returns, and other similar multi-level questions that your team asks frequently. Out of office and holiday alerts specific to texts easily set up by your own account manager. Unlimited in person or video training for your entire team. Quarterly metrics reviews to ensure you’re reducing spend on expensive channels. Full-scale pilots at an incredibly reduced rate to see the unmatched power of Teckst. 24/7 tech and account management support comes standard for all clients. Our expert software engineers will white-glove install Teckst, free of charge. We can also send you instructions for self-installation upon request. Request a demo today here!